Jessie Smith Jamieson was the eldest daughter of John Jamieson and Elizabeth Whitton Jamieson, of Edinburgh. 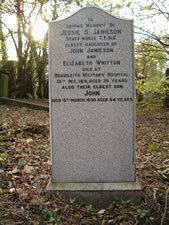 She died aged 30 in Craigleith Military Hospital, and is buried in Dalry Cemetery. As we do not have a photograph of Jessie, we place one of the gravestone. Her name is on the WW1 memorial of St Michael’s Church.